HOLY Spirit Catholic School student Jason Alsemgeest is in a hurry to emulate his swimming idols, which is why he has entered tomorrow's Magnetic Island Swim. 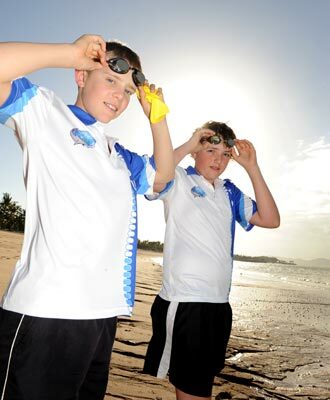 The Townsville Tourist Swimming Club youngster teams up with fellow 12-year-old, Patrick Schinkel to become among the youngest entrants in history to attempt the 8km swim. The duo joins a record number of team entries in the year's event, approaching it as a 2x4km relay. Having braved frosty winter mornings to see the work Kylie de Rooy put in to win her three-peat of island swims in recent years was enough to convince Jason to join the club's proud history. "There are a lot of swimmers at the club who train here who do it every year," he said. "I've been down the last two years to watch the people that I know. It's great looking up to the main contenders like Kylie and Matt Pegg," Jason said. Looking across Cleveland Bay at a shadowy Maggie Island yesterday, Jason readily admitted to being a "little crazy". For The Cathedral School Year 7 sporting all-rounder Patrick, standing on the water's edge at Picnic Bay for the first leg starting at 9am is a moment he couldn't have dreamed of just months earlier. "When I first heard the idea I thought 'no way'," he said. "But after all the training, getting better as a swimmer has really made me believe in myself." The pair aims to complete the crossing in 2 hours 30 minutes. The leaders are expected to reach Strand Beach by 10.30am.